Over the past few days, I tried my hand at making cake pops. 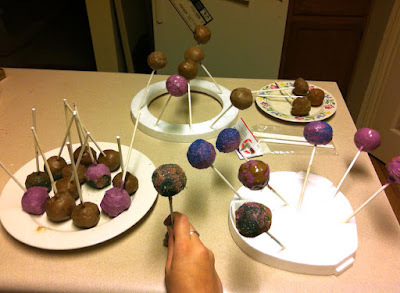 For those who don't know, cake pops are cake and icing mushed together, rolled into balls, chilled, put on sticks, dipped into melted chocolate or candy, and decorated. 1. I don't own a regular rectangular baking pan. I thought I had two circle pans, but I couldn't find those either. All of my pans are shapes. The book pan shape actually works really well for a basic shape and it split the cake into two sections, which actually made it easier to break apart. 2. While breaking apart the cake by hand was a TON of fun, next time use the food processor. It'll make more consistently sized crumbs and will do so in a lot less time. 3. Making half a batch of icing is more than enough to blend with the cake crumbs. Glad I figured that out before making a full batch. 4. A two tablespoon cake ball is actually rather large. 1 set of "dough" makes about 30 at that size. 5. Using the adjustable measuring cup was a great idea because I could pull the slider out, put crumbs in, and then push it all the way to the end which would compress the cake crumb dough together quickly and then I could pull the slider back out and it was already in a somewhat round shape. 6. Popsicle sticks are NOT the same as lollipop sticks. 7. Sometimes the cake balls lose a bit of their roundness when sitting in a container overnight. Be gentle if you need to reshape them. 8. When going to dip the coated cake pop in sugar, make sure the coating is a touch try and that there is enough sugar on the plate so that you don't end up leaving some coating on the plate (oops!). 9. Melt more than you'll think you need. 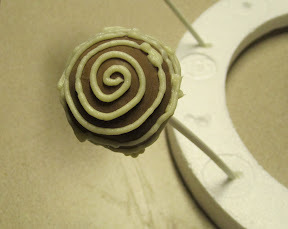 Chocolate has a lower melting point to coat the cake pops well than the Wilton Candy Melts. 10. Wilton Candy Melts do not cover the cake balls as easily as the chocolate does. Also, the coatings from both the chocolate and the candy melts are not nearly as thick as you are worried they are. This is a good thing. 11. Light color sugars all look the same on chocolate. Some color combos work better than others. 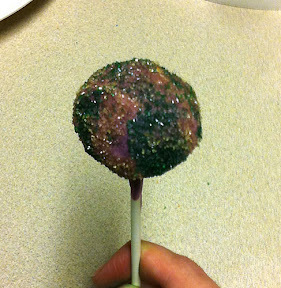 When you have purple candy melts and yellow and green sugars, impromptu Mardi Gras cake pops are an awesome idea! 12. Invest in something to put the pops on when decorating/for serving. While styrofoam left over from a recent purchase is a great reuse of resources, that sort of styrofoam doesn't really work all that well. 13. Icing sticks well to both the chocolate and the candy melt coating. 14. 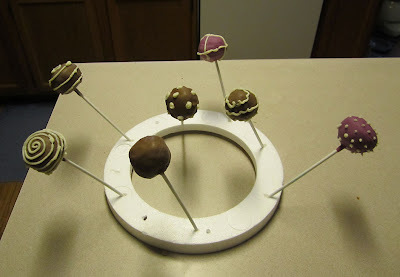 Making cake pops is a long day or multi-day process (time to bake the cake, time to let the cake balls cool, time to let the coating cool before decorating or serving) and trying to do the dipping and decorating a hour before you need to go somewhere doesn't work well. 15. Cake pops are very very tasty and the cake is nice and moist because of the icing mixed into it. Yum! Overall, I'd say this experiment was a success and I will probably be making many more of them in the future.